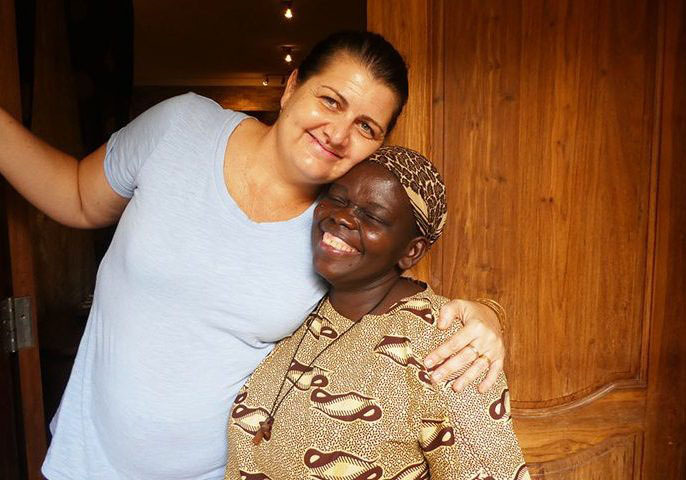 Donna Duggan is from Brisbane, but has been based in Arusha, Tanzania since 2005 after meeting and falling in love with a local man, Naseeb Mfinanga. 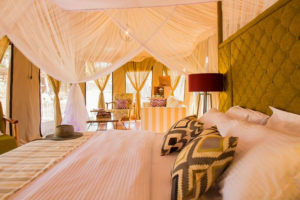 Donna and Nas married, had two children, and together, established Maasai Wanderings – a tour operation and Nasikia Tented Camps – an under canvas accommodation portfolio and will open their first lodge on the Rift Valley Escarpment in February 2019. How did Maasai Wanderings come about? I was volunteering as a nurse in Moshi, Tanzania in 2004, and Nas was my neighbour! After spending some weeks chatting and getting to know each other, a relationship blossomed. I saw a very clever man, a loyal man, a man that I knew would love me forever. He said that he saw the same but claims that he knew it from the first moment we met. We set up Maasai Wanderings to preserve culture and wildlife, through a range of safaris and tours. You have established several community projects, what are they? We always wanted to make sure that we were committed and generous members of the community and used some profits towards making sure that many benefitted from tourism. We have built and extended schools in Maasai communities like Ilkurot, Ol Tukai, Le Manyatta and Esilalei – additional classrooms, porridge programs, teacher salaries, uniforms and more. We have contributed towards several orphanage programs with consistent food and clothing donations. We work in partnership with Pack for a Purpose and make sure any donations reach the intended communities. We always participate in Arusha community programs and also pay school fees for a variety of students in the Arusha area. How many children do you assist through the projects? Almost 4000 through various means – from porridge to school fees to leadership seminars and so on. The Maasai have a different approach to school and not all children can go. Can you explain a bit about that? This is changing, but it is a slow process. With the Maasai still often living a polygamist lifestyle, they can have several children of the same age at the same time. With their belief that cattle come first, this means that the children must take turns in grazing the cattle (distance from home dependent on rainfall) which is the job of the young boys. And with so many children in the boma to look after, the young girls are held back for babysitting and household chores. Once menstruation starts, the young girls are then targeted for early marriage – again it is improving but still a real issue. These are all hurdles for the youth in Maasai communities to gain an education. What do you love most about the Maasai and the work you do in the community? I can see both sides of the argument – education vs traditional way of life. They would not be who they are if they did not uphold their traditions through tribal wars, colonial times and so on – but then to be able to retain their place in modern society and maintain tribal pride, they need to be educated to equip themselves for the challenges ahead when it comes to the developing world. I like the Maasai for their honesty (almost naïve at times), their pride, their ability to thrive in remote areas and the fact that they do not hunt the wildlife for food in the buffer zones that they occupy. 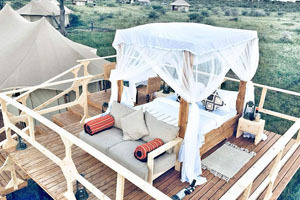 You have several safari lodges, where are they and how can guests contribute to your projects? 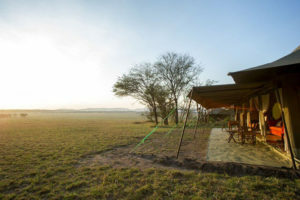 We have Tarangire Ndovu Camp in Tarangire National Park and at our four camps in Serengeti National Park – Nasikia Mobile Migration Camp, Naona Moru, Ehlane Plains and Kaskaz Mara, guests can support through Pack for a Purpose when they come to experience our camps and the magnificent national parks. At the new Mandhari Lodge in the Rift Valley Escarpment, which opens in February 2019, guests can visit one of our schools at Esilalei for classroom interaction/assistance in porridge service. Can you see your projects having an impact? Yes indeed, even district education statistics prove it. For example, Matim primary school in Le Manyattawas ranked 87th in the district when we first started to implement an assistance program there. Now they are ranked 16th! There is no better way to help than to be an educated traveller. 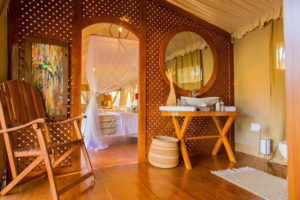 When I visit travel shows around the world or potential clients, the first thing that I talk about is Tanzania as a country, and what it has to offer. Tanzania is so alive with incredible landscapes, vibrant cultures, stunning wildlife and of course genuinely welcoming people. Once a traveller is aware of where they are visiting, what are the potentials and set their own expectations – then you can always find a myriad of ways to be creative in the help that you give. In the end, yes the simple stuff counts like exercise books and pencils – but the bigger picture is that it is important to support local communities in finding a way to support themselves and make their own choices about their future. The ‘teach a man to fish’ principle is really the way forward and the word ‘teach’ is key – when you educate, you create a ‘prevention is better than cure’ ideology.